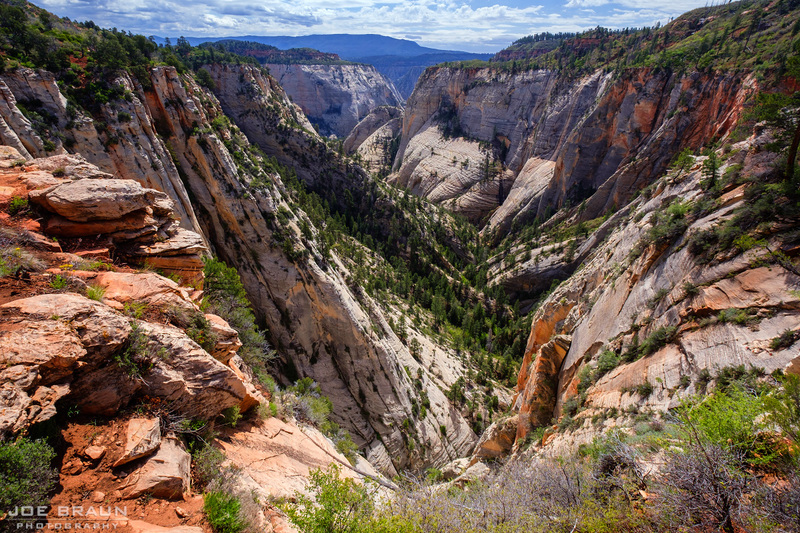 Starting from Lava Point, the 18-mile hike down the West Rim Trail to the Grotto in Zion Canyon is a great adventure, either as a long day hike or as a two-day backpacking trip. While most of the trail is level or downhill, it is still a long journey and should be considered fairly strenuous. 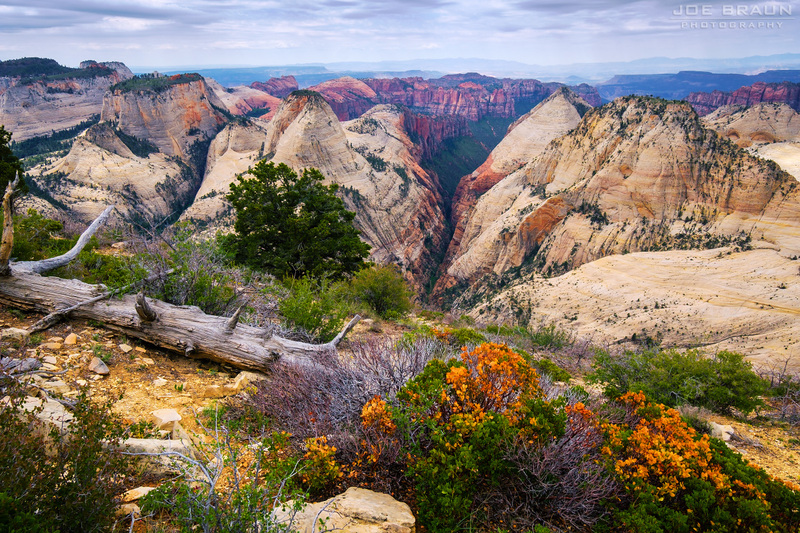 The "top-down" hike is aesthetically pleasing as the scenery starts out fairly subdued, but each viewpoint gets better than the last until the grand finale of the trail making its dramatic descent through the White Cliffs into Zion Canyon. And if you have the time and energy, a jaunt up Angels Landing is a wonderful thrilling diversion near the end of the hike. Rating: Fairly strenuous hiking/backpacking route. Time Required: 9-12 hours with a light day pack, 10-16 hours hiking with heavier backpacking gear. Elevation Change: 3600-ft total descent from Lava Point to the Grotto with a few ups and downs, including a 400-ft ascent out of Potato Hollow and a 300-ft ascent out of Sleepy Hollow. Seasons: Spring through fall. Access to Lava Point typically blocked by snowfall in winter. Permit Required? YES, if backpacking at one of the campsites. NO, if doing as a day hike. From Springdale, drive west to the town of Virgin, then turn north on the Kolob Terrace Road. It is roughly a 19-mile drive up through the Kolob Terrace Section until the well-signed dirt road turnoff for Lava Point. Once in the NPS boundary, at the road junction, stay right to head to Lava Point or turn left to drive down to the West Rim Trailhead. The final stretch to Lava Point is mostly level and is easily accessible by non-4WD vehicles. The road down to the West Rim Trailhead may be a problem for non-4WD vehicles in wet conditions. When doing the top-down West Rim Trail hike, consider paying one of the Springdale outfitters' shuttle services for a ride to Lava Point. It will save you the effort of having to retrieve your vehicle after your hike. Lava Point isn't actually the starting point of the West Rim Trail; the trailhead is located about a half-a-mile southeast. Lava Point is, however, the typical drop-off point if you are getting a shuttle ride to do the hike. 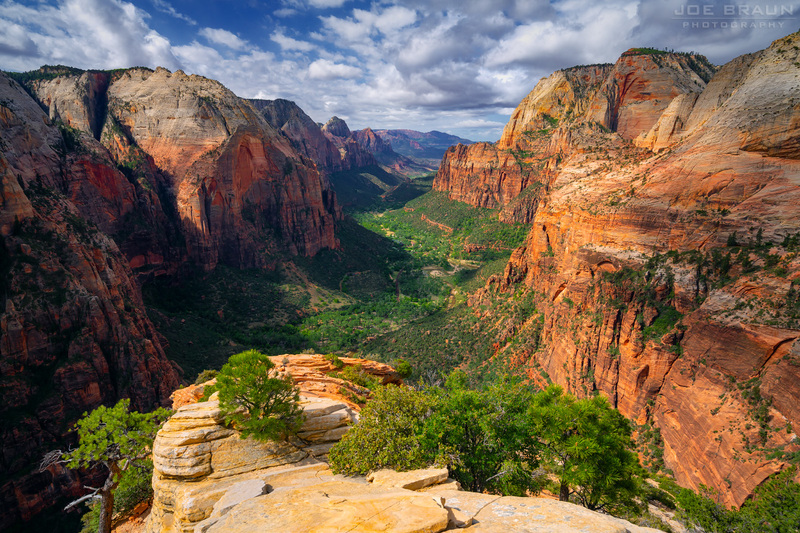 As the highest point in Zion, the view from the lookout is a great teaser that hints at the great scenery in store. To the southwest, you can see Wildcat Canyon and the Great West Canyon in the distance and to the southeast, you can see the White Cliffs above the Zion Narrows and the main canyon. The West Rim Trail takes us south along the plateau between those two large canyon systems. The first few miles of the West Rim Trail are pleasant hiking through the cooler temperatures of upper plateau. It is best to rip through here as fast as possible to allow more time for the more dramatic scenery that comes later. Less than one mile from the trailhead is the spur trail down to Sawmill Springs and campsite 9. At three miles, the first notable viewpoint is the "SGA teaser viewpoint" that gives a view straight down the Left Fork of North Creek to the majestic South Guardian Angel peak in the distance. Over the next two miles, the trail makes a gradual descent into the valley known Potato Hollow, the location of campsite 8 and a spring that is quite often dry in the later months. If you have the time, it is worth it to hike the trail east to get a good view into the mysterious Imlay Canyon to the east. The trail slowly descends as it turns heads east, now offering amazing views of Heaps Canyon, Castle Dome, Behunin Canyon, and Mount Majestic to the south. Soon enough we reach the junction where the Telephone Canyon Trail rejoins the West Rim Trail and just beyond is the short spur trail to Cabin Spring (aka West Rim Spring); this spring is usually a reliable source of water. After passing the saddle above Refrigerator Canyon, the deep narrow wedge-shaped slot visibile to the right (west) of the trail, the trail starts another long descent, offering non-stop amazing views down to the bottom of Zion Canyon with Angels Landing coming more prominently into view. Take great care exploring the cliff edges as there are 2000-foot sheer drops everywhere. From Scout's Lookout, it is roughly only one more hour of hiking down to the Grotto Trailhead. The trail heads down the famous Walter's Wiggles switchbacks that take down you into Refrigerator Canyon, and then a final set of switchbacks lands us on solid ground by the banks of the Virgin River. 18.5 miles after leaving the isolated Lava Point, we are happily at the Grotto and the end of the trail. Lava Point to Potato Hollow. Potato Hollow to The Grotto. 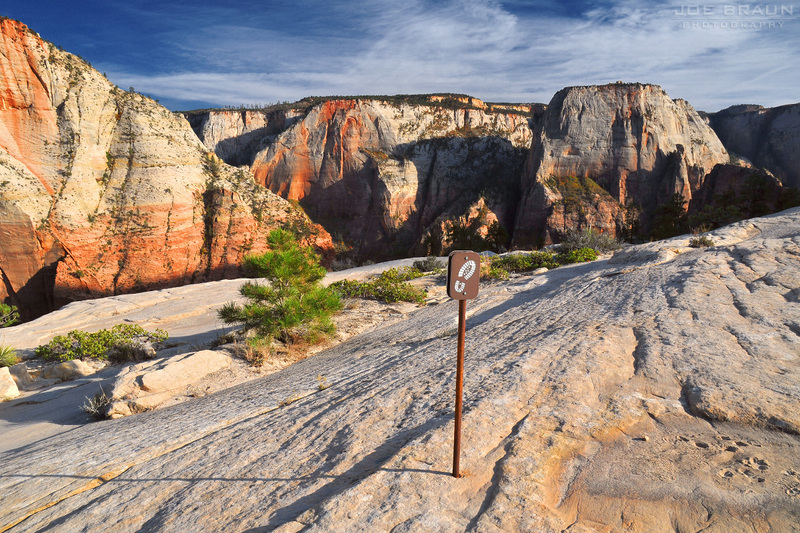 Camping along the West Rim Trail is permitted only in the 9 designated campsites. 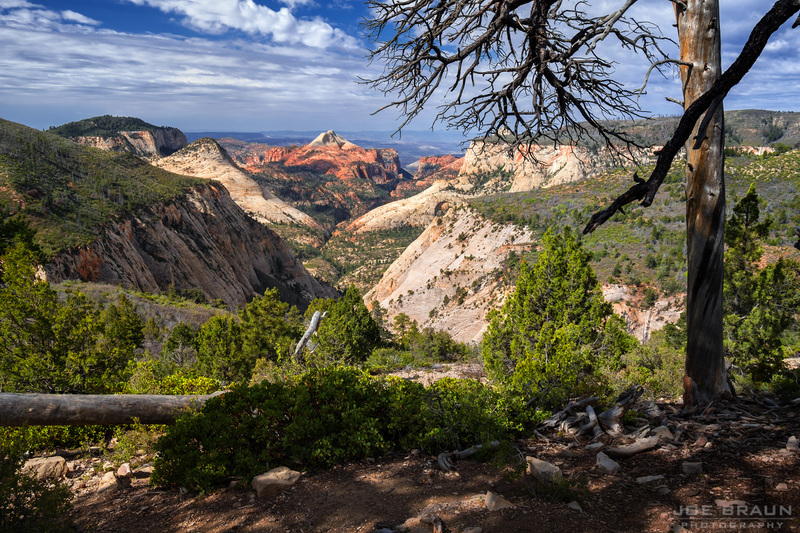 A wilderness permit is required for any multi-day hike; choose your campsite when you reserve your permit or pick up a last-minute permit at the Zion Wilderness Desk or at the Kolob Visitors Center. 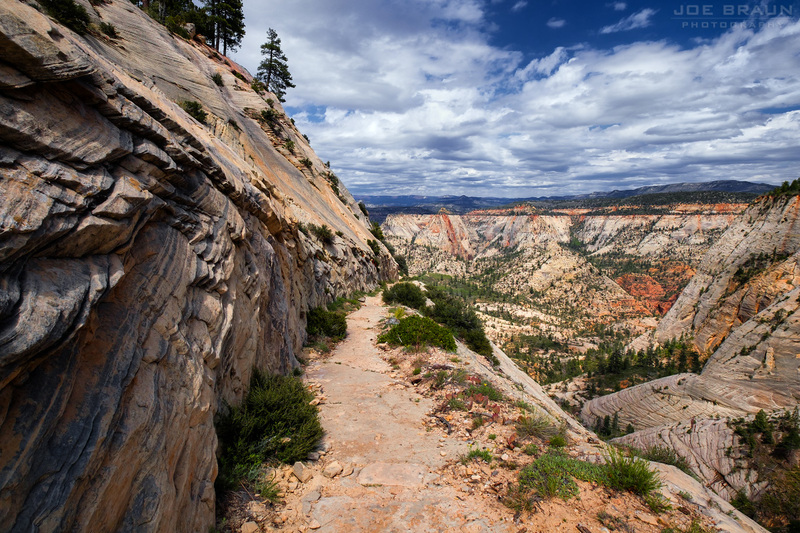 (See the official Zion Backpacking page for more info on permits.) Please do not squat at any campsite that you don't have a permit for; it's poor etiquette and will ruin somebody else's wilderness experience. Just about all of the designated campsites are appealing in their own way, but if you are doing the top-down two-day hike, logistically, campsites 1-6 are the ones to shoot for. Campsite 1: Located in a nice grove of ponderosa pines, offers great view of sunrise. Campsite 2: Close to Cabin Spring, secluded back from the trail. Campsite 3: Located well off of and above the trail with a few ponderosas. A bit exposed. Campsite 4: Located off of the trail, but a bit exposed especially after the 2007 fire. Campsite 5: Exposed site not very aesthetically pleasing, but offers great view of sunset to the west. Campsite 6: Located off the trail near the Telephone Canyon Trail junction, back from the trail with great views to the north and west. Campsite 7: An oddly located site southwest of Potato Hollow, not much of a view but nicely secluded. Campsite 8: Potato Hollow, a wonderfully secluded site to get away from it all, but logistically not an ideal spot for the two-day hiker. Campsite 9: Stave Spring, well off the main trail, a useful site for the Trans-Zion hiker. Note: A handful of first-come first-served drive-in tenting campsites are available at Lava Point. The camping area is primitive, but there is a pit toilet and garbage cans. 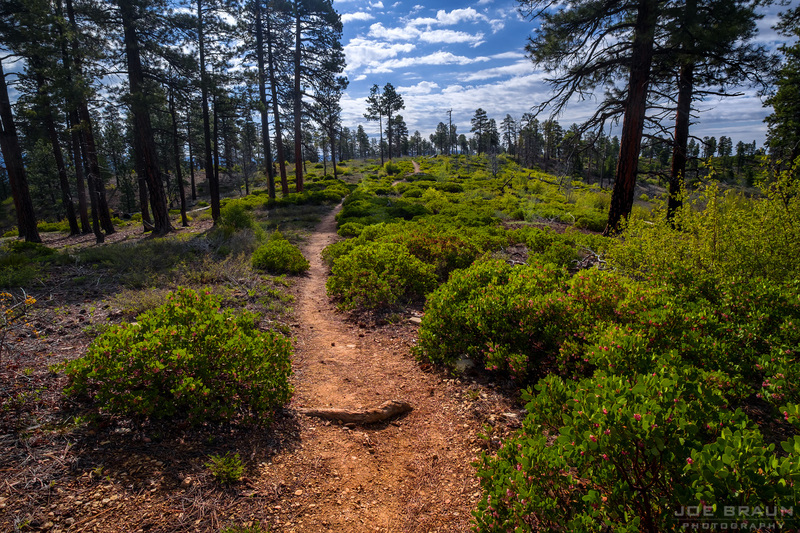 The best times of year to hike the West Rim Trail from Lava Point are spring through fall. At an elevation of roughly 7900 feet, Lava Point is roughly 3400 feet higher than the floor of the main canyon, so cooler temperatures can be enjoyed in the summer, but winters can see a lot of snow build-up on the high plateau. The Kolob Terrace Road is typically closed for winter (not plowed) half a mile before the Wildcat Canyon Trailhead, so Lava Point is only accessible by snow mobile or snowshoe. The descent into the main canyon can also be treacherous with snow drifts and ice formations covering exposed sections the trail. The West Rim Trail typically clears up in April or May, but check conditons with the Wilderness Desk as things vary from year to year. If you are doing the lower part of the West Rim from the Grotto, bring your own water. On the upper plateau, water is occasionally available at Sawmill Springs, Potato Hollow, and Cabin Springs (aka West Rim Spring), but check conditions at the Wilderness Desk. Early in the season, water is plentiful, but during the later months, these water sources may run dry. I love the West Rim Trail! From the subtle beauty of the upper plateau to the amazing descent into the main canyon, this is still one of my favorite hikes with incredible views. I have done the top-down route as both a day hike and a two-day backpack, and I can recommend either way as a great experience!